In an English country garden? In an English country garden. Nana Mouskouri, remember her singing this? Globally speaking the biggest selling female artist of all time. As a multi linguist she sold all over Europe, America and Asia. Quite surreal to think of this young woman from Crete singing about native English flowers and gardens. This garden is in Cheshire. Very close to home. The Dower house to a big estate, and open annually for charity. I love it here. An oasis of tranquility, adjacent to a beautiful boating lake swamped in yellow lillies, and overlooking a village green opposite a cluster of ancient cottages reserved for estate workers. The garden to be absolutely frank, isn’t the most cultivated or colourful or groomed, but I like it for those reasons. The English love a good nosey, and here is the perfect excuse, pay a couple of pounds, wander round the borders and the arboretum, and pretend, just for a short while that you are Lady of The Manor, about to disappear indoors to prepare for dinner, you’ve maybe been out earlier with your trug, collecting rose blooms for the table, not it’s time to break out the pearls and enjoy a glass of chilled champagne in a crystal coupe. If you’re going to have a dream, have a big one! ‘Love is the flower of life, and blossoms unexpectedly and without law, and must be plucked where it is found, and enjoyed for the brief hour of its duration.’ Quote by D H Lawrence. Stunning embroidery by renowned artist Alison Holt. Take a look at her website, really interesting work. Her work is a marvel, at first I thought this recently acquired piece was a painting, but it is in fact stitched. So clever, such talent. Alison’s work is sold for thousands of pounds. 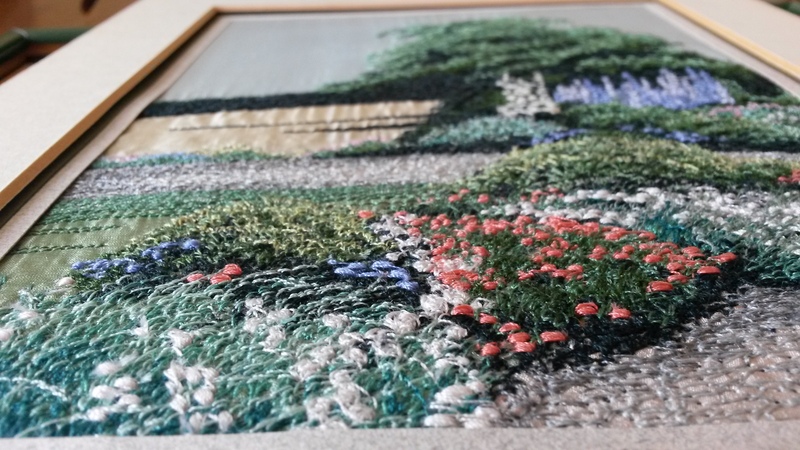 I have this fabulous garden embroidery by her for sale in my shop. This is a rare, collector’s item, and won’t be around long. I’m very tempted to keep it.